Playtech Live Sic Bo is based on an ancient Chinese game. Known as “Dice Pair”, you bet on what you think the result will be when 3 dice are rolled. 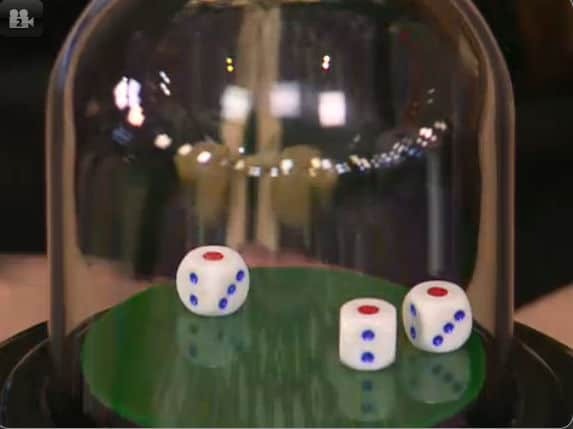 In reality the dice are not rolled, but are shaken in a glass sphere by an electronic agitator that is controlled by a live dealer. With the Playtech version, the dealer sits behind the table/betting grid. Bets are placed on the table and when betting time has completed the dice are rolled. 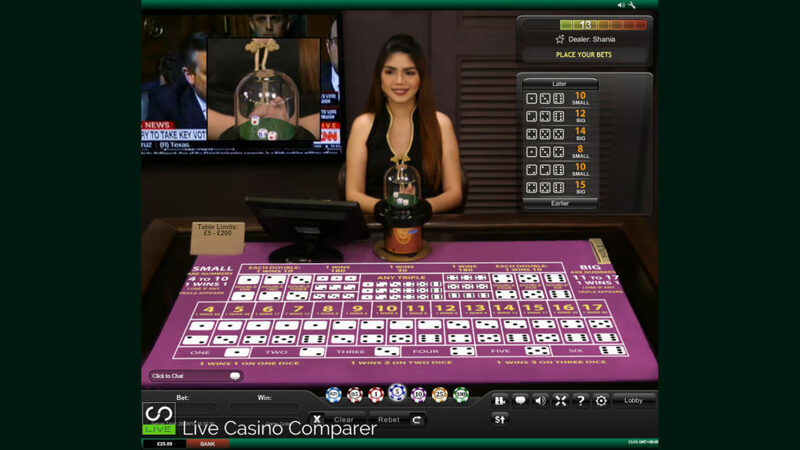 Live Sic Bo is streamed from Playtech’s studio in Manilla. Behind the dealer a TV is on, showing a current news channel. This allows the more superstitious players to be re-assured that the stream is really live. Live Sic Bo is all about the betting, with lots of different combinations to keep even the most ardent gambler happy. What’s great is you’re able to bet on more than one outcome. If you’re careful and clever you can limit your betting exposure while still trying to make a small profit. The game round is started with players placing their bets on the table. In this live dealer version of Sic Bo by Playtech it’s not possible to see other players bets on the table, only your own. When the betting time has completed, the dealer will activate the shaker and the dice will be rolled in the Bell shaped glass dome. A close-up of the dome shows the results, which the dealer will call out and then enter the details into the computer system, so all the bets can be settled. A bet on Small will win if the total of the 3 dice is between 4 to 10. Big pays if the total is 11 to 17. If all 3 dice are the same value both bets will lose. A winning bet pays even money 1:1. You’re betting that a single number will appear on at least one of the dice. If that happens you win 1:1, if two appear you get 2:1 while all three pays 3:1. This is a bet on two dice combinations. There’s 15 possible combinations. If the one you’ve selected comes in you win 5:1. This bet is for the total of the three dice to be a particular number. 4 & 17 pay 60:1, 5 & 16 pay 30:1, 6 & 15 pays 17:1, 7 & 14 pays 12:1, 8&13 pays 8:1 and 9,10, 11 &12 all pay 6:1. With this you’re betting that a specific pair will come in. If your pair does you’ll be paid 10:1. A named 3 of a kind pays 180:1. While any 3 of a kind will pay 30:1. The playing interface is the older looking version. This appears square like on the screen, rather than the more modern looking letter box style. Settings include the ability to control sound, the quality of the video stream and also the camera view. In this interface only one camera is operational, although you can select the mode to view the screen in. Full screen mode is the biggest but quite honestly it’s not much bigger than the standard screen size. For poorer quality connections mixed mode with computer generated imagery is used. Some people prefer to play the game in this mode. Sic Bo has a Return to Player or RTP of 97.3% over the long term. This is the same RTP as European Roulette and is achieved from the Big / Small even money bets. These bets don’t pay out for a small win of less than 4 or a big win more than 17. This is the built in edge for the casino, hence a return of 97.3%. Live Sic Bo is certainly an interesting game and very different from card based games that I’m used to playing. The closest that I’ve come to playing something like this before is Yahtzee when I was a kid, which is a poker type game played with dice. It’s Asian roots sees the game being offered more to the Asian markets than European. 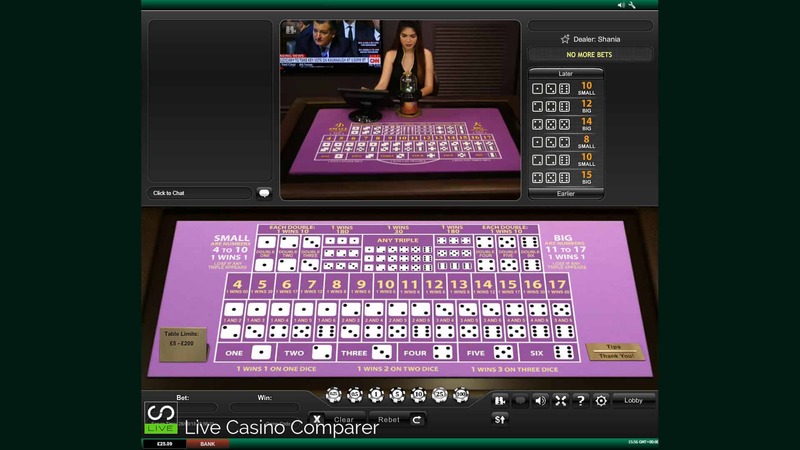 However there are a few live casinos that carry the game, with Bet365 and Betfair being two. If you fancy a complete change then I’d recommend having a play. You never know, you might get lucky on your first bet like I did!